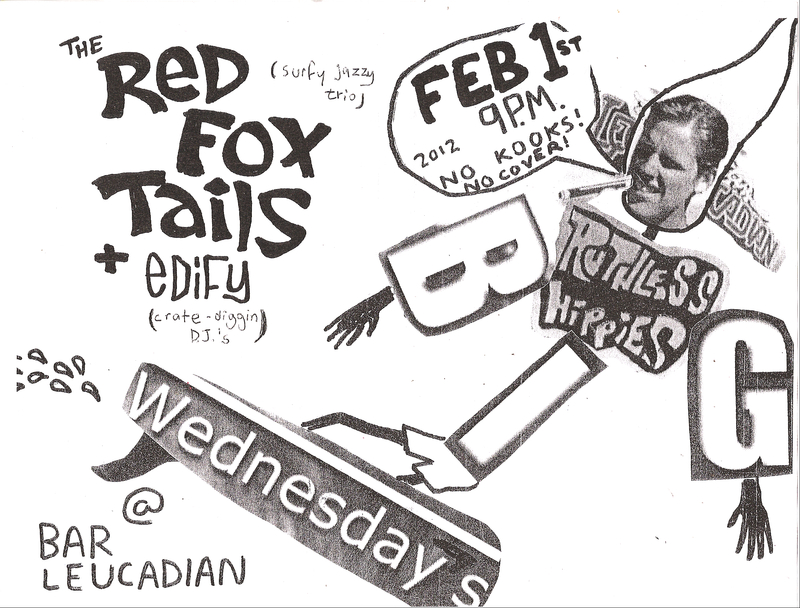 Chase the Red Fox Tails to the Bar Leucadian, tomorrow the 1st of Feb! Cruise on into the Bar Leucadian tomorrow night circa 9:00 pm and get your groove goin’ with the surfy soul jazz of The Red Fox Tails at the Ruthless Hippies’ Big Wednesday! The Red Fox Tails are a local Leucadian jazz trio known best for their consistently jivin’ melodies. Chances are you have already had the opportunity to listen to these Tails at one of their local gigs around town, perhaps at Surfy Surfy or perhaps at the library, either way if you missed the opportunity then, you definitely shouldn’t miss the opportunity now! Wednesday’s night gig is the 9th in the line of Ruthless Hippies’ Big Wednesdays, and we couldn’t be happier to give the honorable spot to anyone else. Stick around after for midnight vinyl grooves spun by Edify. 31 Jan	This entry was written by summerfunonthe101 and published on January 31, 2012 at 9:33 PM. It’s filed under Big Wednesday, Ruthless Calendar and tagged Bar Leucadian, Jazz, Leucadia, Ruthless Calendar, Ruthless Hippies, Surfy Soul Jazz, Surfy Surfy, The Red Fox Tails. Bookmark the permalink. Follow any comments here with the RSS feed for this post.